Turned out, I was meant to present for 40 minutes to an entire grade level, seated and prepared to be amused. I was going to present a 40 minute SOMETHING 6 times back to back. So, naturally, I banged my head on the desk and went to my supply closet/office and stared into the shelving, hoping that an idea would come to me. Then I made some plans. K-2? Walk in the park. I picked some popular picture books and planned a storytime that could be done a cappella. Grades 3-5 were much harder. I decided to focus on booktalks, read-alouds, and games. 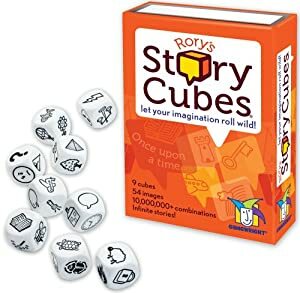 If you’re wondering what the story cubes activity is, here’s the skinny. It’s a game where you roll a series of dice with symbols and combine them to make a story for the pictures. While I was staring into the storage shelving, I saw the game and realized that I have a giant inflatable die. I taped clipart symbols to each side of that giant die and tossed it into different parts of the crowd to make an interactive story-building activity. The kids LOVED this. I was so worried that they would fight over the die, but they did great. To control the chaos, I controlled the narrative. They would show me what was on top of the die when they caught it, and I would make up the next segment of the story from that. If I got stuck, I’d ask what should happen and they’d raise their hands to help me out. There was some shouting, but it was under control. The day of was exhausting. If there was a word that could describe the feeling of imminent death and the serious case of lock jaw that ensued, I’d use it. Speech-doom? Introverts’ peril? Here’s what I appreciated about the experience, though. I got to learn all about the struggles of a local school librarian and I think that connection was invaluable. It made me so much more confident in my ability to handle…just about anything libraryland can throw at me. (I mean, for librarians, this kind of event is the gauntlet. And I did it!) It also proved to my team that I can be trusted with big things and provided a model for having a huge impact with little concerns for staffing and branch coverage. I requested to have a partner if I was ever sent back for an event like this, but even sending two people to cover an entire elementary school is conservative for outreach, I think. What I didn’t like as much? It’s been almost two weeks and I’ve only seen about 10 kids from the elementary school come in to sign up. Now, they could easily be going to other branches or just waiting for school to end. I can’t lie, though. I was expecting droves. PS, 13 Story Treehouse is the PERFECT book to read aloud to a crowd because it can be done storytime-style with the book facing the kids and showing them all the great illustrations. Every kid I’ve seen from this school has asked for it.